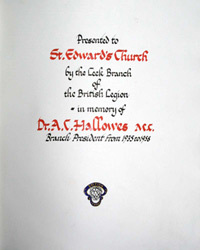 Within St Edwards Church in Leek is displayed a Roll of Honour presented to the Church by the Leek Branch of the Royal British Legion, in memory of Dr A. C. Hallows who was the branch president from 1935 to 1956. We would like to thank the Parish of St Edwards Church for allowing us access to photograph the Roll of Honour. 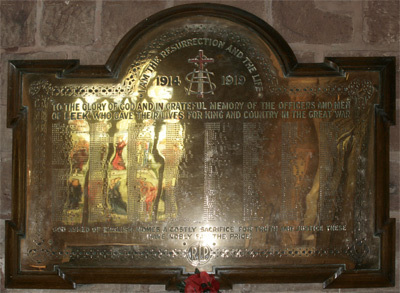 Also within the Church is the brass memorial plaque which commemorated the fallen prior to completion of the Nicholson War Memorial. Within the Churchyard of St Edwards is also the original town war memorial used for remembrance prior to 1925. Wreaths are still laid at this memorial on Remembrance Sunday. 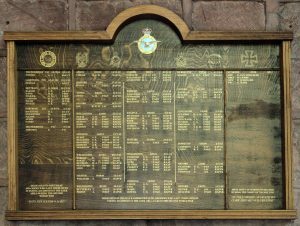 Not related directly to the town of Leek is also a memorial plaque to the air crew of the USAF and Commonwealth who died in the local area. This was often due to bad weather and high ground whilst over flying the area.